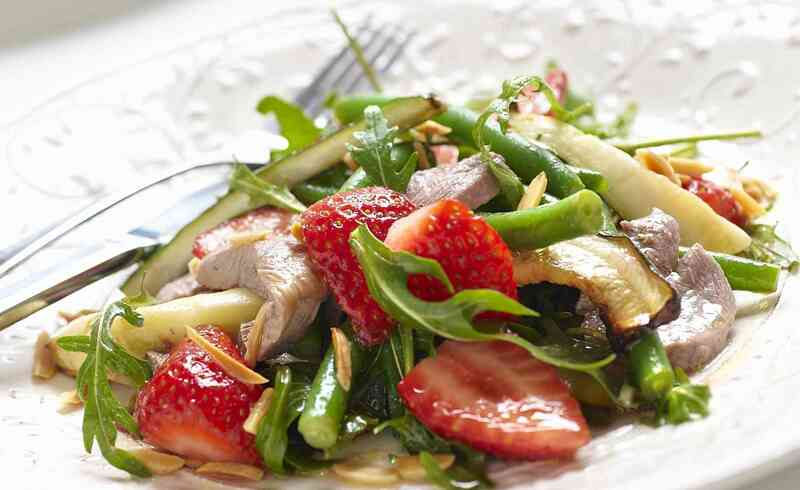 This nice crisp salad made with seasonal produce showcases the versatility of strawberries. Whisk together the olive oil and white wine vinegar, then add tarragon leaves. Allow the sit for 2 hours and remove tarragon. Puree half of the strawberries and pass through a sieve, then whisk into the vinaigrette. Taste and season with cracked pepper. To prepare salad, flake the breast meat into shreds or slice finely. Slice remaining berries, then toss with zucchini, beans and leaves and half the vinaigrette, then top with shredded meat and nuts. Drizzle with remaining dressing then serve.